It's that time of year again! Mini session season for family portraits. Holiday cards. Apple cider, fall colors. Family bonding! 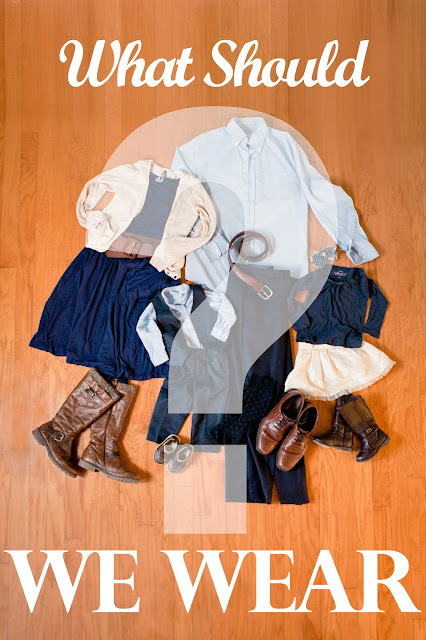 And the question comes each year, "How do I assemble outfits for family pictures? What should we wear?" So here are some quick tips for putting those outfits together. Before you jump into the details, first go through these questions to help you determine the right style to use. So for Autumn family portraits, that's easy right? Autumn colors. But woah, slow down there. Consider how you might blend into your setting.. that is why it is important to think of that even before we get started. If you setting might a lot of browns, tans and not a lot of color, then instead of choosing all browns, where you will blend too much with the background, you will want to consider adding that pop of color, even if it isn't bold, like a moss green or ruby red. This will help pull you out from your background. For a summer session, there are a lot of green tree's, so therefore, you may want to avoid the greens, so for fall color, consider mixing the blues, tans or greys. Another thing to consider with your setting, is what kind of attire makes sense with it. Plaid on the beach... not so much. Plaid in a forest or rustic setting, perfect. Mix it up, but don't go CRAZY! Remember, the focus should be on the individuals, not what they are wearing. Basically, the outfits should compliment them the way a painting is complimented by a pretty frame but not distracting from the art piece. This means go easy on any busy patterns, contrasts, bright colors, avoid shirts with logos/brands/prints , etc. But still have fun! After considering your setting and the colors it will provide, you can consider the color palette. Be careful here. Too many colors and too wide of contrast can get busy and distracting fast. I recommend choosing three basic colors, then from there expand those colors to their varying tints or hues not far from it until you get to no more than 6. Obviously it will not be exact but it will give you a base to work off of! 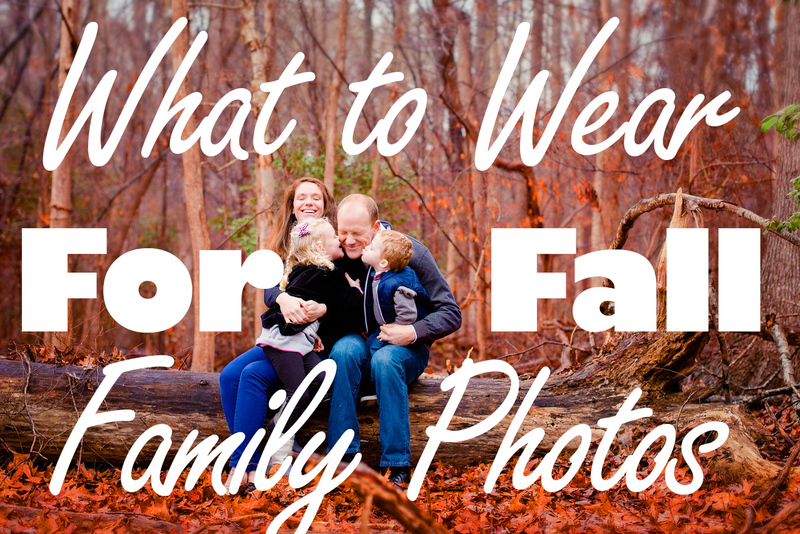 Especially in communicating outfits to a larger group for family portraits. Also, consider your final product. What room will it hang in and will it be something you want to display in that setting. Here are some starter color pallets for Autumn. 4. Don't neglect the details! Something like white socks on dad with his dark pants and shoes will stick out! Simple shoes for the little guy, perfect. Or just go with bare feet if it works and isn't too chilly. A fun accessory like a hat or scarf make for additionally fun props and cute poses and can always be taken on and off as desired. Matching white shirts with matching blue jeans sound familiar? Too matchy matchy and frankly screams, we are trying too hard! What you wear should be you, but a bit nicer and blend you as a family, but not so much that you blend together like one giant muppet. So mix up the colors, textures and tints that they compliment each other without being too distracting but will distinguish the individuals and not blend them together. 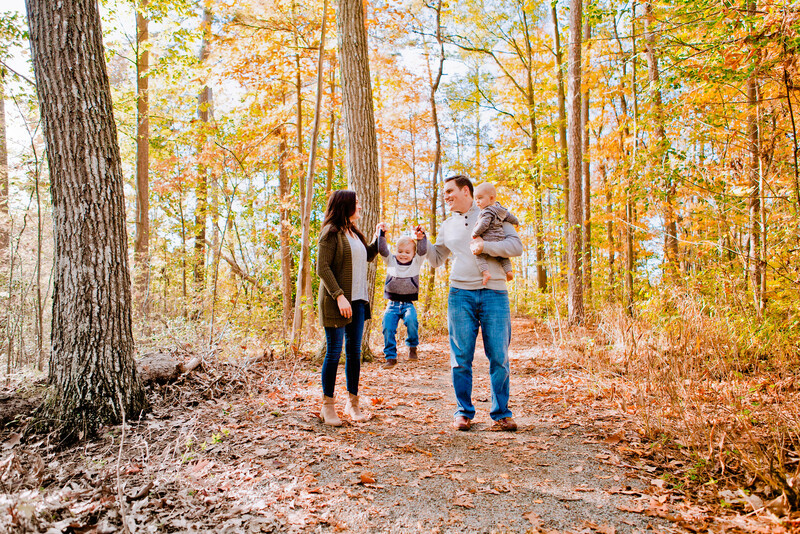 Book you mini sessions before they fill up!